The overall winner on the night was Grove Academy team, The Green Bean Co. 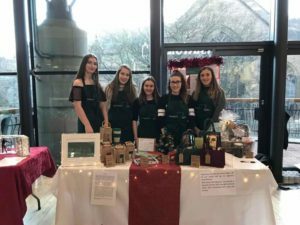 This entrepreneurial team of five young women will be representing the Tayside region at the Scottish finals in Edinburgh on the 5th June. The girls now have the potential to go on and represent Scotland at the British final and potentially take part in the European final. The Green Bean Co didn’t win because they had made the most profit. They were chosen by the judges, because overall they had achieved the most, both within the company and personally. The Green Bean girls developed a strong company brand, with a popular product. Supported by encompassing marketing, a brilliant customer rapport and the organisation behind the scenes to keep track of everything, respond to issues and opportunities, keep everything running smoothly and maintain a good team relationship. There were other winners on the night, with different teams being recognised for their reporting, written and oral, presentations, personal journey’s marketing and more. Each of the individual young people involved will have gained from taking part. To help celebrate the young people’s achievements the evening included positive messages from Chris van der Kuyl, who took part in YES himself as a student, is the previous Chairman of Young Enterprise Scotland and is now an international ambassador for the programme, the Lord Provost of Dundee and leader of Dundee City Council, John Alexander. All wishing the young people well and acknowledging the hard work they had put in, but the incredible knowledge and experiences they had gained from taking part. There were also inspirational talks from local entrepreneurs Zoe Forbes owner of Sweetpea Cafe and Katie Reid, Managing Director of Tour Tag both part of Coca-Cola 5×20. These incredible young women shared their journeys and illustrated to the young people just how valuable the experiences they have had by participating in the Company Programme are, as well as how far they could potentially go. Enterprise programmes offer so much to the young people who take part in them. On a basic level they offer real-life business experiences; and with a huge proportion of companies in Scotland being small or medium there is a strong possibility that young people will be self-employed or work in a very small team and need a variety of business skills. Even for those young people with no interest in becoming entrepreneurs or working in the traditional business or sales positions, enterprise programmes offer vital experiences to build and develop invaluable soft skills, required in any career and industry. By taking part the young people must work in teams, must learn to prioritise, negotiate, communicate, problem solve (creatively and practically), take responsibility, as well as build their work ethic and professional attitude. Taking part also allow the young people to uncover their personal strengths and attributes and how they can bring these to positively impact on the projects and teams they work with. 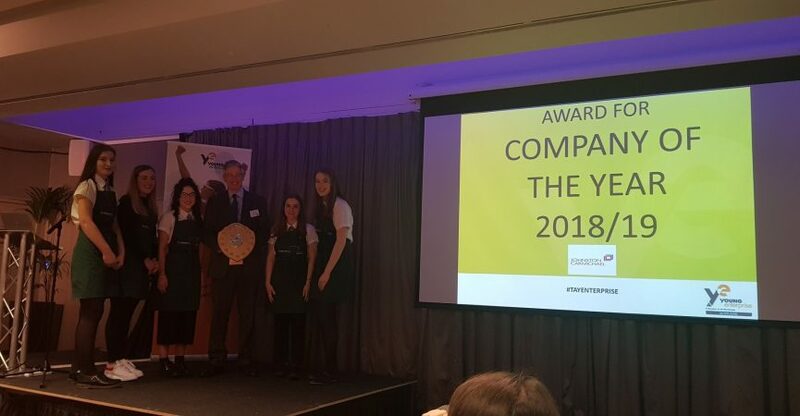 The Company Programme is an incredible opportunity for senior pupils that calls on them to form a company, sell a product or service and report back about the challenges and successes they faced. The pupils have the option to sit the University of Strathclyde Business YES Exam as part of the programme, which is recognised by Scottish universities. As of academic year 2019/20 the Company Programme will also be recognised as the equivalent of one Higher. The programme requires a link teacher, but very little input from teaching staff is needed, as the young people are supported throughout by a local business professional. The Company Programme is an ideal option to sit in a course choice column, providing young people a course that offers incredible practical experiences, to support theoretical knowledge gained in other classes. The Company Programme also works well as an extracurricular activity for determined students who want expand their horizons and experiences. Click here to find out more about the programme, or contact Bruce Donaldson (tayside@yes.org.uk) to enquire how it could fit into your school.